I had a head of broccoli in the fridge that was nearing its end and, since I did not want to let it spoil, had to think of some way to use it quickly. I had used up both my regular and sweet potatoes a couple of days ago, so steaming the broccoli to serve alongside potatoes wasn't an option. I could have made a vegetable stir-fry with broccoli in it, but didn't really feel like having a stir-fry. Besides, I had no tofu, and I like tofu in my stir-fry. What I did feel like having was a vegan cream of broccoli soup. 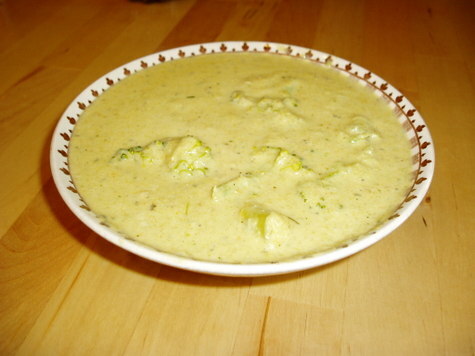 Now this delicious dish isn't a close approximation of cream of broccoli soup. If you've been vegan for only a short time and remember the taste and texture of dairy-based cream of broccoli soup well, don't set your taste buds for that exact taste. But I think this creamy broccoli soup actually has more flavour and more character than the dairy-based cream of broccoli soup. I used creamed coconut and coconut milk to give this soup its creaminess, and coconut does have a unique taste. It isn't as neutral a base as dairy is. But I've found, from my experience with creamy Norman soups, as also with various Asian coconut curries, that it does not really make dishes sweet as the coconut-uninitiated might think. It in no way interferes with the taste of robust, even spicy, savoury soups and stews. You could also use soy milk instead of coconut milk, but you'd probably need to add creamed cashews or silken tofu to end up with a thick, creamy soup. In a large pot, combine diced onion, carrots, broccoli stems and parsley. Saute in margarine for about 5 minutes. Wrap the bulb of garlic in foil and roast in oven for about 15-20 minutes. Add the stock to the sauteed vegetables, along with 1 tsp of the rosemary and the 1/2 tsp sage. 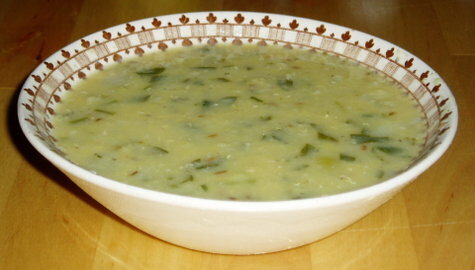 Mix well and bring to boil, then reduce heat to medium-low and simmer, partially covered, for about 15-20 minutes. By now the garlic should be roasted and taken out of the oven. Transfer the soup, as it is now, to a blender, or use a hand-blender as I do, and blend thoroughly. Put the broccoli florets and the remaining tsp rosemary into the soup, bring back to boil and simmer, on reduced heat, for another 10 minutes or so. Squeeze the soft, roasted garlic into the heavy coconut cream and blend thoroughly. Pour the now garlicky coconut cream into the soup, stirring constantly to ensure a smooth finish. Enjoy on its own or with crackers. Serves six to eight, or if pigging out, four. Place lentils in a large pot with water and bring to near boil on high heat. At near boiling point, bring the heat down to medium and make sure you scoop all of the foam or "scum" off the top. When the heat is brought down to medium, cook the lentils for about 30 minutes, or until the lentils turn a pale yellow and are fairly soft. Meanwhile, in a frying pan, heat the sunflower oil and saute the onion and cumin seeds until the onion is translucent. Add the sauteed onion and cumin seeds to the lentil pot along with salt (I generally put in a small palmful) and parsley and cook for an additional 10 minutes. Remove from heat and serve in bowls with some fresh-squeezed lemon juice. Enjoy! This is another veganization of a Normandy dish. It can be eaten hot or cold. Though it may look a bit like a breakfast cereal, this is a wonderfully delicate soup with just a hint of sweetness borrowed from the apples, sherry and coconut cream. In Normandy, so I've read, this soup (that is the dairy-laden version called La Pommeraie Glacee) is often served as a first course to an autumn meal of roast duck or chicken with roasted root vegetables. Vegans wishing to use it similarly could have it before a hearty meal of Tofurkey Roast, roast seitan, or baked tofu and roasted root vegetables. It is hearty enough, however, to have it on its own as a main course. That's how we had it. And the recipe makes so much that there will most certainly be leftovers to try chilled. Sautee sliced leeks in margarine for 3-4 minutes on medium heat, covered. Toss in sliced apples and cook, uncovered, for about 5 minutes, stirring occasionally so apples are well coated with margarine. Pour in the stock, add potatoes, and bring to boil. Reduce heat and simmer for about 30 minutes. 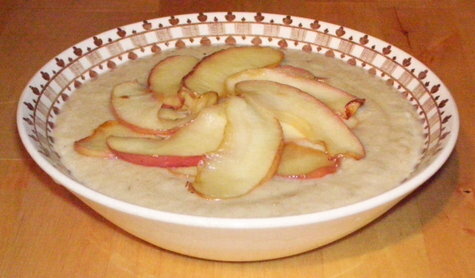 When apples and potatoes are soft, puree in blender, then return to pot and stir in coconut cream, sherry, and cinnamon. Garnish with apple slices sauteed in margarine for 5 minutes and then drained on paper towels.